How much does it cost to travel to New Zealand? How much money will you need in New Zealand? 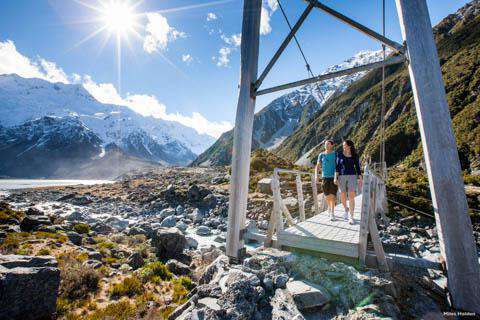 NZ$177 ($120) is the average daily price for traveling in New Zealand. The average price of food for one day is NZ$34 ($23). The average price of a hotel for a couple is NZ$204 ($138). Additional pricing is in the table below. These average travel prices have been collected from other travelers to help you plan your own travel budget. How expensive is New Zealand? How much money do I need for New Zealand? New Zealand offers some of the most dramatic and impressive landscape on Earth. The geography is very diverse and the natural beauty is breathtaking. You'll find jagged mountains, clear lakes, and steep fiords, all within a short distance of each other. Most visitors come to the area to explore this natural beauty, and the country continues to grow in popularity with tourists. Made more famous by the popular movie series, "Lord of the Rings", New Zealand's stunningly beautiful natural setting is matched by no other. You'll also find countless opportunities to enjoy adventure sports, with an absolutely stunning vista as your backdrop. There are incredible treks where you can wander deep into the wilderness. You can raft or kayak through some of the most swift rivers, and you can go climbing on some of the most incredible rocks. If you're really looking for an adrenaline rush you can try your hand at bungy jumping, caving, or ice climbing. If you're an outdoor enthusiast, you'll rarely find a place that has more to offer than New Zealand. Once you've had your fill of the adventure sports you can head to the cities and relax at a local pub. Auckland is a great place to spend a few days. Some of the more popular areas include the Viaduct Harbour and Mission Bay, but you'll also find plenty of museums, restaurants, and bars nearby. Christchurch is popular because of its English character, which you can see in the architecture and layout of the city. The Maori culture offers a unique influence over the area. You may hear the language spoken in the far northern parts of the North Island. There is also a traditional cuisine that you should try if you have the opportunity. Food is typically prepared in a hangi, or earthen oven, during festivals or large gatherings. Meat, vegetables and puddings are slow cooked in a covered pit for several hours before they are served to guests. It's a great experience if you have the opportunity to participate in this traditional custom. The largest airports in New Zealand are in Auckland and Christchurch. Auckland is served by the most international flights with over twenty destinations reached by twelve different airlines. Christchurch has flights to Sydney, Melbourne, Brisbane, Singapore, Kuala Lumpur, Buenos Aires, Santiago de Chile and Tokyo. Flying to New Zealand can be expensive so it is best to research all of your options in advance before booking your tickets. You'll usually get the best rate if you make reservations well in advance. New Zealand has very strict biosecurity laws. Make sure you fully understand what you are and are not allowed to bring into the country, and make sure you declare all items that are required by customs officials. Food and agricultural products are strictly regulated, so if you have any souvenirs with you from other countries, make sure that you fully understand the entry requirements. There are several tourist oriented bus companies within New Zealand. They provide transportation to many areas throughout the country, but even so, you will find having access to your own vehicle more convenient and enjoyable. With a private car you can access the more remote and interesting parts of the country. The more popular tourist bus companies include Flying Kiwi Adventure, InterCity Coachlines, and Naked Bus, which is typically the cheapest option. There are ferries that connect the North and South Islands. If you're traveling with a car you can take the ferry that runs between Wellington and Picton. Don't be surprised if there are unexpected delays due to weather or scheduling challenges. You can't go to New Zealand without attempting at least one adventure sport. There are the more traditional options available, like bungy jumping, sky diving, or kite surfing, and then there are more creating activities like heli-hiking, shark cage diving, and fly by wire. Pick an activity and give it a go before you leave. These activities can be expensive and a little risky so do some research and make sure you go through a reputable company before you sign up. Waiotapu Thermal Wonderland: Located at the southern end of the Okataina Volcanic Centre, this is an attractive and impressive mix of mud pools, geysers, bubbling lakes, and steamy terraces. It has many hot springs and is most noted for its colorful appearance. Tongariro National Park: This national park, on the country's North Island, is created by three volcanoes. Ruapehu, Ngauruhoe, and Tongariro are all located in the center of the park. It's the oldest national park in the country and is a great place to either ski or hike. Fiordland: Located in the southwest corner of the South Island, this area's geography is spectacular in appearance. It looks like it jumped off the screen of "Lord of the Rings," and is an absolute must see in the region. The snow-capped Alps are dramatic and breathtaking and the deep lakes are strikingly blue in color. New Zealand cuisine is similar to that of Great Britain, with only subtle differences. You'll find plenty of diverse restaurants in the larger cities, but in the smaller towns they may be harder to come by. You can almost always find a local pub that serves up fish and chips however. Cafes are common throughout New Zealand as well and you'll find plenty of good expresso. Custard Squares: These squares are a French pastry that is made with layered pastry dough and a cream. They are quite sweet and can be served as a simple dessert or a small snack with coffee. Pavlova: This is a meringue based dessert that is made with a thin but light crust. It was originally developed in Russia, but is now common throughout New Zealand. It is usually served with whipped cream and sliced fruit on top. Fish and Chips: Made with battered and fried fish, this dish is served at almost all pubs around the country. The fish is usually served with french fries and is comparable to the dish found throughout Great Britain. Transportation in New Zealand can get expensive, mainly because you have to rent a car to see anything. Most of the sights and attractions are not in cities, but instead the most remote parks and wilderness. This is a country that is about trekking, getting outdoors, and getting away from everything. As such, public transportation is virtually impossible if you hope to have a full experience. To save some money, find some travel companions when you arrive. That way you can split up the rental car expenses as well as the driving. Do make sure ahead of time that you're priorities and travel styles are the same. It's important that everyone gets along over the course of the trip or else the experience could be disastrous.